Windows 10 growth slowed slightly last month but remained robust enough to push the nearly-one-year-old OS over the 21% share bar, according to new data from metrics vendor Net Applications. In June, Windows 10 powered 21.3% of all Windows PCs, a 1.9-point increase over May. Net Applications measures user share -- an estimate of the percentage of the global personal computer inventory that runs a particular operating system -- by tallying unique visitors to clients' websites. June's gain was less than May's impressive 2.2-point jump, but still the third-largest, one-month increase since August 2015. With less than a month left before the free Windows 10 upgrade offer expires, the OS is on pace to post a user share mark of 23% of all Windows PCs by the end of July. If so, Windows 10 will have bested Microsoft's 12-month uptake record holder: Windows 7 clawed its way to 20% in its inaugural year. Windows 10 now runs about 320 million machines, according to Computerworld's calculations, which used Net Applications' numbers and Microsoft's claim that Windows powers 1.5 billion machines. The new figure represented an increase of about 28 million in June, or around 933,000 each day. By comparison, nearly 4 million Windows PCs were upgraded to Windows 10 each day during the first complete week of its availability, Aug. 2-8, 2015. Last week, Microsoft claimed 350 million devices were running Windows 10. Unlike Net Applications, which tallied only personal computers, the Redmond, Wash., company also counted tablets and smartphones, as well as the Xbox One video game console. Other share sources echoed Net Applications' portrayal of Windows 10. Irish vendor StatCounter put Windows 10's global usage share -- a metric that represents online activity -- at 21.9% for June, an increase of 1.9 percentage points from the month prior, but down from the 2.1-point gain of May. Likewise, the Digital Analytics Program (DAP) tapped Windows 10 at 25.6% of all Windows PCs, an increase of just three-tenths of a percentage point over May, or just one-fifth the April-to-May boost. DAP tracks visits to more than 4,000 websites run by the U.S. government, so its data is highly U.S.-centric. DAP's smaller increases in both May and June -- when compared to Net Applications and StatCounter -- may be due to the already brisk uptake of the new OS in the U.S., leaving fewer customers who haven't accepted the free offer. 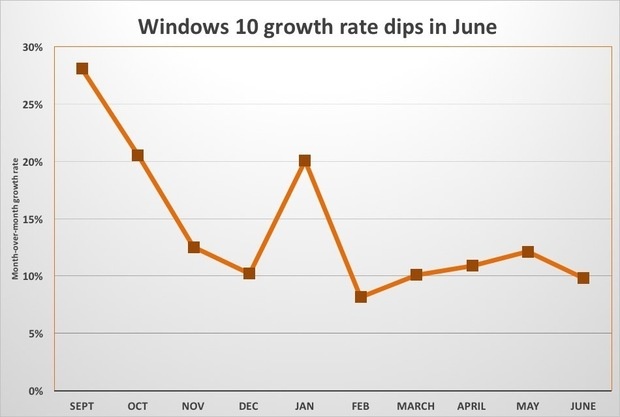 DAP's data -- specifically the slowing of growth -- may be a preview of the global situation for Windows 10 once the free offer expires July 29. But projections for August and later are simply impossible, because of the expiration. Most, including Computerworld, expect growth to drastically decelerate but that's conjecture at this point. But if the uptake rate does plummet in the short term, it's likely to return to the positive in 2017 and 2018, as enterprises start to roll out the OS to their devices.